Today I thought I would show you some comparison photos of my various green holo polishes, as well as showing you my experiments of wearing Picture Polish warning and white wedding over black. 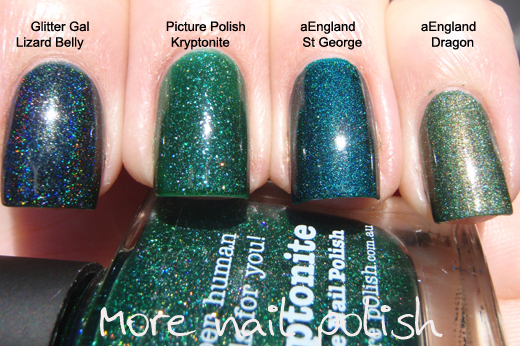 First up is the comparison that shows Glitter Gal Lizard Belly, Picture Polish Kryptonite, aEngland Saint George and aEngland Dragon. As you can see, they are all totally different from each other, and each and everyone of them is stunning in their own right. And of course, if you're like me, you need every one of them! 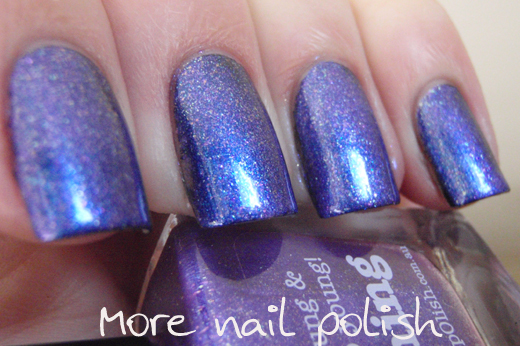 Same polishes shown in the shade. Next up is Picture Polish Warning layered as two coats over a black base. Booyeah, this one is awesome. In fact I think I love this even more over black than when it's on it's own. Finally, I received a comment from a lovely reader wondering what Picture Polish white wedding would look like layered over black. On the index and ring finger I did two coats and because of the thickness of the white polish it really is kinda bleagh! But if you apply one careful thin layer over black, like shown on my middle and pinky fingers, you can get to see all the gorgeous multi coloured glass fleck flakies. 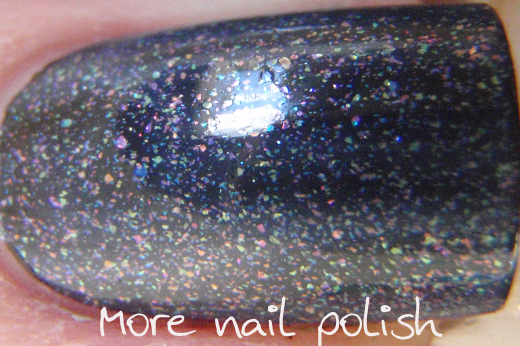 Here is a macro of one coat of white wedding over black, and you can see all those tiny colour flecks. Gorgeous!!! o.O you are bad for my wallet! There was no doubt about me ordering Warning but I bought Kryptonite too & I don't even wear green that often! Oh wow, White Wedding over black is crazy awesome! I ordered a few aEnglands during the sale and can't wait to get them. I see all these awesome swatches and can't wait to wear them! Love white wedding over black- gorgeous! Boy, am I happy I bought Krypyonite! It's the prettiest of the bunch :). great comparisons. 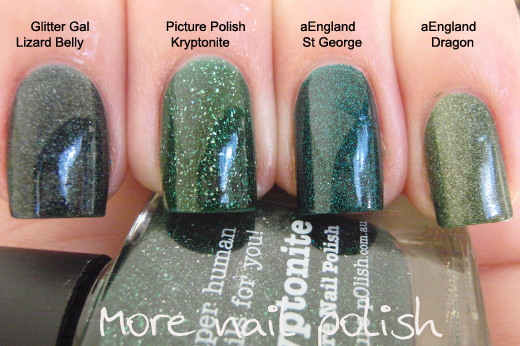 I actually have all those greens :) I love the a-Englands but Kryptonite is the winner with that deep green jelly! So I had these plans not to buy these for a month or two then you posted. Stop the enabling you little enabler you.